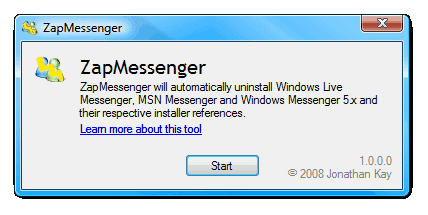 Microsoft Messenger variants, such as MSN Messenger, Windows Live Messenger or Windows Messenger, sometimes cause difficulties during uninstallation throwing error messages such as “Another version of the product is already installed”, “Your computer has a newer version of MSN Messenger than the one you are trying to install”, ““Your computer has a newer version of Windows Live Messenger than the one you are trying to install” or “The feature you are trying to use is on a network resource that is unavailable”. It can be quite frustrating to discover the root of the problem especially when the user wants a clean uninstall to install a newer version of the product again. Keith over at Techie Buzz discovered the Zap Messenger application which can completely uninstall MSN Messenger, Windows Live Messenger and Windows Messenger from a computer system. It solves all kind of problems that prevent the uninstallation of those products and is not limited to the ones mentioned in the first paragraph. Zap Messenger is a portable application that does require the Microsoft .net Framework 2.0. The author is not listing the operating systems the software program is compatible with but it seems that it should run fine on Windows XP and Windows Vista.